This short video below outlines one of the major motivation for doing this work, my work in an Islamic school. I am committed to supporting healthy environments for Muslim children to thrive and prosper. I found that many of our children were ill equipped with the skills necessary to challenge the racism they faced, whether it came from their peers or from the broader society. I don’t want people to think that the experience was all negative. I saw many wonderful examples of students and families who embodied Islam. I have a young daughter and I constantly pray that my daughter grows up to be like many of the girls and young women I came to know. Empowering our youth with healthy self-identities and with a sense that they can help create a better world are two of my greatest motivations. Those two years teaching secondary school left a lasting impact on me. Those students taught me much more than I could have ever taught them. I still see those beautiful young children, although most of my students are adults, in college, starting their own families, and taking on leadership roles themselves. 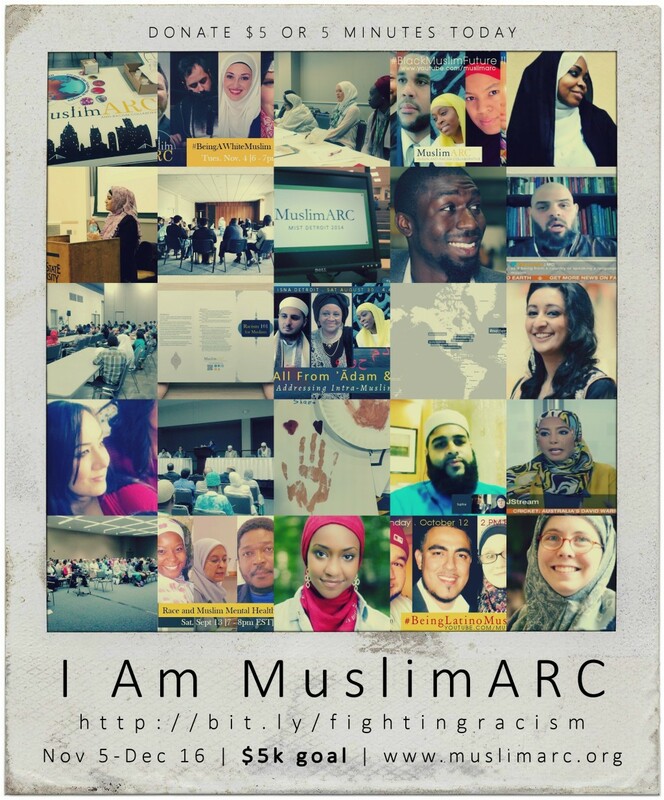 Muslim Anti-Racism Collaborative in many ways represents the beauty of Islam. Although I felt those deep bonds of sisterhood with individuals over the years, I had struggled calling my co-religionists brothers and sisters. Sometimes it was because of some of the socio-economic, gendered, and racial power dynamic that dehumanized us. Other times, it was because I felt in the end our futures were not intertwined. But this past year, the tireless work Namira Islam, Bangladeshi American woman who lived thousands of miles away, Laura Poyneer, a white American Muslim who at the time lived on the other side of the country, and over forty volunteers who gave their precious time showed me the depth of our bond. Our shared visions, frustrations, hopes, and struggles bind us together. I am asking you to join us in this movement. We are need your input to know a bit more about MuslimARC’s reach. Please take a moment to complete this short survey. If you checked any of these than, YOU are part of the Muslim Anti-Racism Collaborative. Come out and show your support for anti-racism education and activism in the Muslim community. Join us for a hashtag event that is part of MuslimARC’s new LaunchGood campaign to both raise awareness and funds for anti-racism initiatives and projects throughout the US. Give $5 or 5 minutes to spread the word. 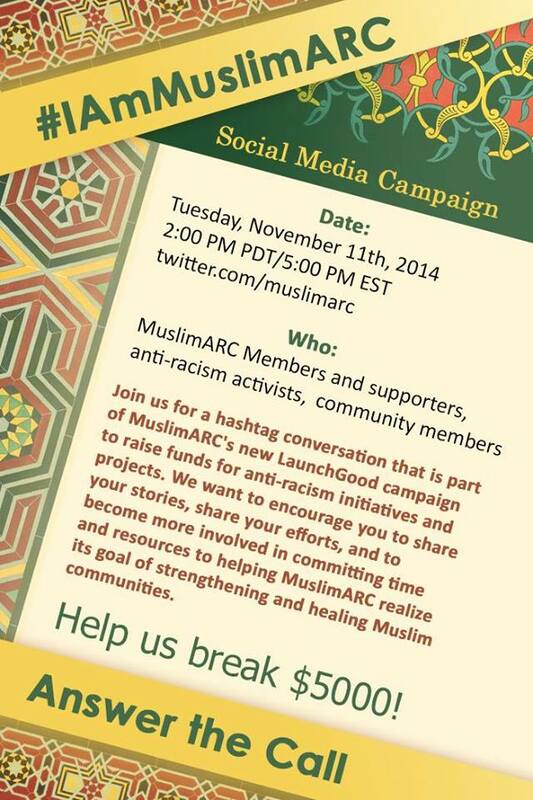 Follow the event at https://twitter.com/muslimarc and use the hahtag #IAmMuslimARC to be part of the conversation on Tuesday November 11 2:00PM PDT/ 5:00 PM EST.